All transactions are safe and secure with a reliable history in online purchasing behind each of our associates. Buy the Punisher Not Vengeance t-shirt to own Punisher clothing and merchandise. "This is not revenge, it's punishment," Frank Castle explains before he unleashes his swift form of justice. His form of punishment is personified on this dark Frank Castle Punisher shirt. 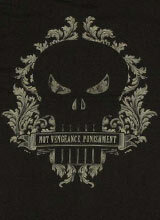 The filigree design on the front of the tee features a silhouette skull logo with the phrase, "Not vengeance. Punishment." The 100% cotton t-shirt is machine washable. Put it on underneath a cozy Punisher sweatshirt hoodie for the ultimate combination of Punisher apparel. This unique tee is perfect to wear as part of your Punisher costume. In addition to the Punisher Not Vengeance tee above, browse the Punisher Clothing Gallery for more apparel like men's and women's clothes, kids shirts or hoodies.